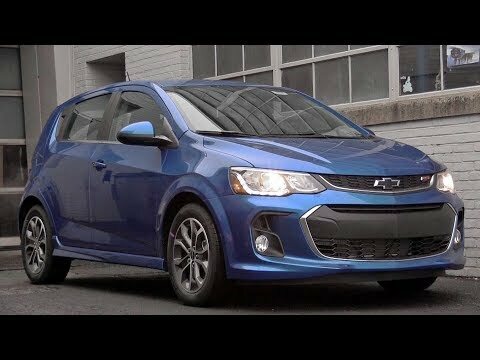 The 2018 Chevrolet Sonic is slightly larger and more powerful than the Chevy Spark, but not quite as big as the compact Cruze. In this sweet spot, the 2018 Sonic offers plenty to like, including a very low starting price, high-tech options like Apple CarPlay and a Wi-Fi hotspot, not to mention sporty styling and an available turbocharged engine. Chevy Sonic: the perfect car for everyone. The Chevy Sonic is a great car. It is small yet spacious so it is perfect for me. I love the luxury of having a smaller vehicle with a big back seat and trunk space. This allows not only for me to be comfortable but my passengers as well. It is a great car for a road trip as well. It has great highway miles and drives very smooth. I love the touch screen radio and the reverse camera it is very helpful. My favorite feature yet is the carplay feature. This feature allows you to hook your phone up to the car and read and reply to messages right from the screen. This feature keeps your eyes on the road and not down at your phone. You can also use it for maps so you are not trying to find it on your phone. It will be right there bigger and more clear. The only downside is that those in the car can see and hear your messages as well. The interior is very chic and modern. There are many features of the car that I am still learning but they are all so useful so far. Starting with the percent of oil left in the car. Though you know about how far you can drive until the next oil change that feature helps a lot. Along with the tire pressure. It is getting cold out and keeping up with the tire pressure is very important. Also with the tires there are locks on them so a person can not just take your tires off of your car. There has not been any problems with my car thus far. I love every bit of it. All in all the Chevy sonic its a dependable and inexpensive way to get around. I really like that my car is small very compact that it fits almost anywhere I want to park it and it's really easy to do with the camera feature it has. It's not very comfortable inside not a lot of legroom for the kids and the seats are very hard. The gas mileage its ok it saves me gas money better than other cars. All in all I am satisfied with my vehicle purchase but it's not all I hoped it would be. Trunk space its average but for a family of 4 not enough. Must buy and great value Chevy Sonic. The car is great for busy city travel and can fit anywhere. Apple carplay is a nice added feature and would not drive without it. The only negative is no passenger armrest and all my passengers complain about it. As a driver I have no complaints with it. Great on gas especially if not hard on the gas pedal. I would recommend buying this car to anyone looking for a cheap new car to get from point A to point B that will e reliable. General Motors LLC (GM) is recalling certain 2018 Chevrolet Sonic vehicles. A joint in the driver's seat-back frame may not be properly welded, reducing the strength of the seat-back frame. In the event of a rear-impact crash, the seat-back may fail, increasing the risk of injury. GM will notify owners, and dealers will replace the driver's seat-back, free of charge. The manufacturer has not yet provided a notification schedule. Owners may contact Chevrolet customer service at 1-800-222-1020. GM's number for this recall is 18178.